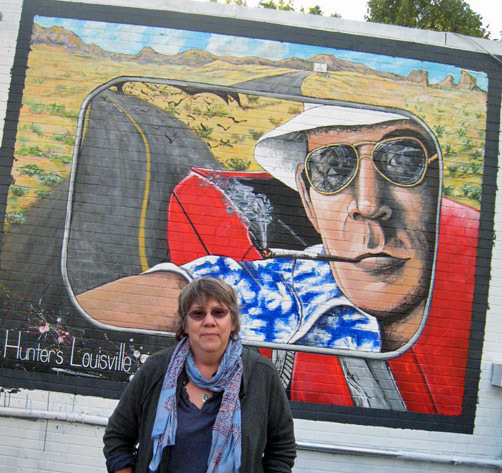 The Hunter S. Thompson mural is painted on the Monkey Wrench located on the corner of Barret Avenue and Winter Street in Louisville, Kentucky. 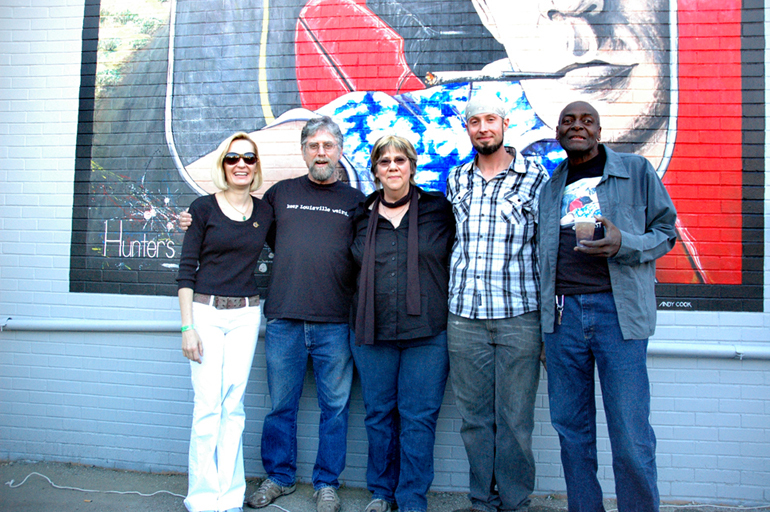 The mural was painted by Evan Leibowitz, Alexander King, Andy Cook and myself under my direction. 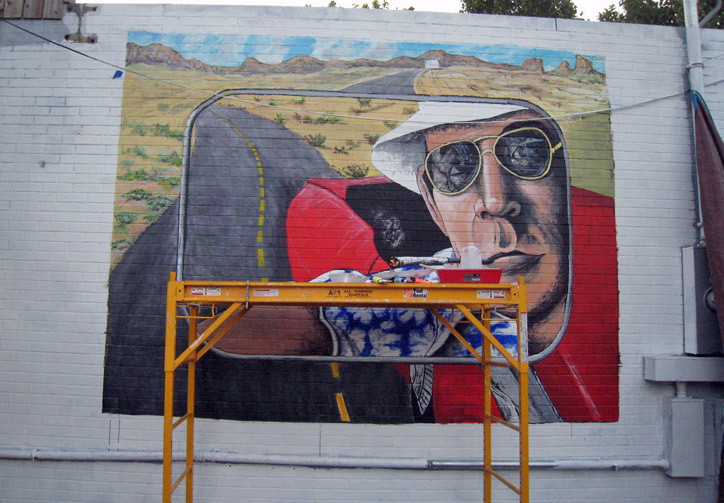 Here's the story of how the Hunter Thompson mural came to be. 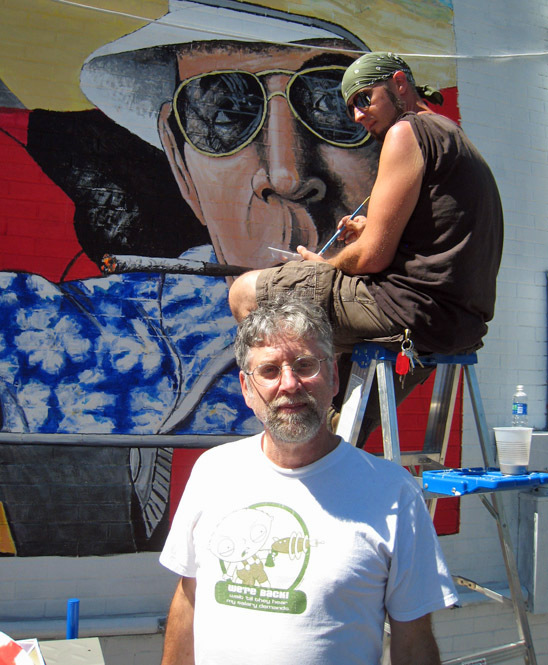 Denny Humphrey (owner of the Monkey Wrench) and I were talking about a mural on the side of his building. One day he told me I could start on a mural whenever I was ready. Some time later Denny told me the Monkey Wrench was going to be the home base for the Hunter S.Thompson festival starting in October of 2010. I thought it would be appropriate to paint Hunter as the subject of the mural so I began researching images. It seemed to me that photographs of Hunter were overused and I wanted to do something different. I came up with the idea of painting Hunter in his red convertible looking into his driver-side rear view mirror, cigarette in hand. It was symbolic because Hunter is from Louisville. I cut and pasted available photos until I got the effect of him looking back in the side mirror. I invited Andy Cook to join the three of us. I told him what the design was going to be for the mural as we talked on the phone. He drew it and brought the drawing the next day to a meeting. I had done a cut and pasted version to illustrate what I wanted and he had a great drawing of what I described so we used that to project the image onto the wall. As the mural developed many changes were made to the design. The finished painting that is now on the side wall of the Monkey Wrench is a true collaboration with input from all four of us. In the first picture below you'll see Anita Thompson, Hunter's widow, standing with us. Anita was pleased with the mural and thanked me for not including negative references. 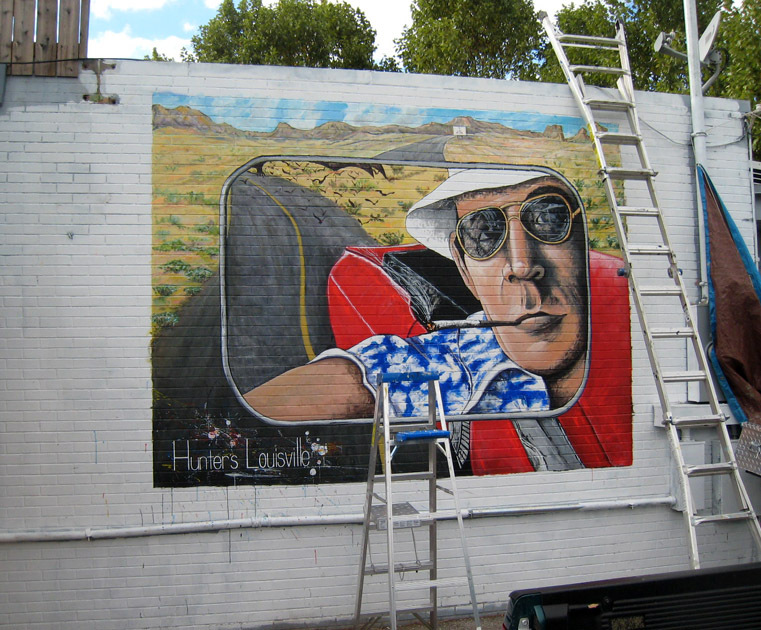 Every day while we were working on the mural people came by to talk to us about Hunter Thompson. Many of them came by regularly to see how it was coming along. I met and talked to a lot of people from the Germantown/Original Highlands neighborhood where the mural is located and as I got to know them I realized how lucky I am to live among them. I love Louisville.